Here's what Super Duper posted about themselves on their site. "Fast food burgers, slow food values. At Super Duper, we serve fast food style burgers, fries, and shakes all made with the best ingredients available to us. 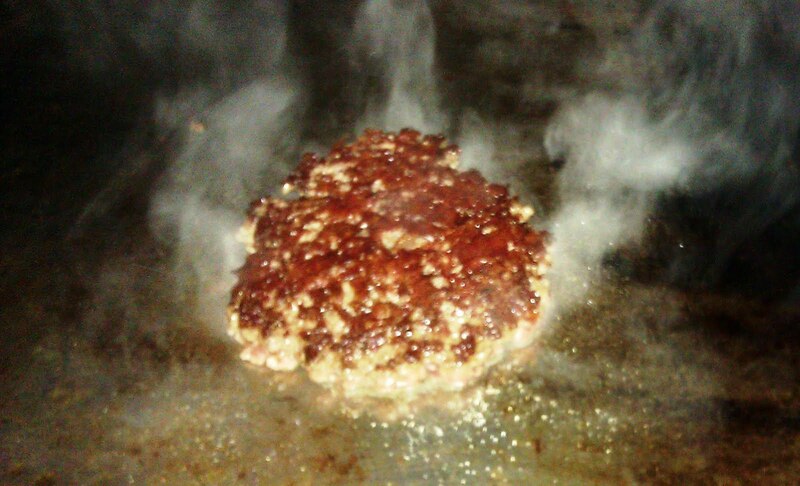 Our beef is 100% Niman Ranch all natural beef ground fresh each day. Our shakes and cones are made with organic Strauss cream from Petaluma, and our pies and cookies for our sundaes are baked daily in house. We offer a chicken sandwich and a portobella mushroom "burger", and we make our own pickles. All of our packaging is compostable, because we care about our environment just as much as we care about our burgers." It had been a mixed bag of burgers in San Francisco, but Super Duper came highly recommended from a reliable source. This was one of those instances where the name was apt. The burgers, and everything else, at Super Duper were, in fact, super duper. This was the best burger that I had tried in San Francisco. We ordered a couple of burgers at the register and settled in for a 4 minute wait. The burgers come out with blinding speed at Super Duper. A "Mini" burger was anything but mini. It was a 4 ounce burger for $4.50 or $5.00 with cheese. I opted for the California Sharp Cheddar. The 1/2 pound burger was 2 bucks more. The Beef: This was the usual Niman Ranch 80:20 Chuck. Super Duper demonstrated that it was possible to create a superlative product from Niman Ranch beef. The burgers were JUICY, BEEFY, tender, a little funky, and just plain delicious. This beef tasted nothing like the uninteresting burgers made from that same beef, which we had been bumping into all over town. Perhaps, it was because they took daily delivery of the beef, which was freshly ground by their supplier. Whatever the reason, the expression "bursting with flavor" came to mind. 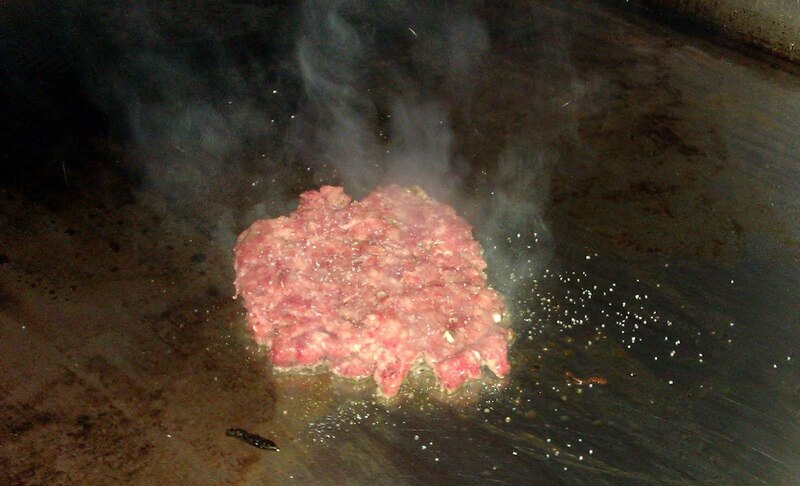 The Seasoning: This looked like simple sea salt, which they hit both sides of the patty with. The juicy, flavorful beef combined with the coarse flakes of salt to create a perfectly savory combination. The Sear: WOW! They got an intense, crunchy, flavorful sear onto the burger patty. This was accomplished by cooking it for one minute on each side and otherwise leaving it alone. This was the only properly seared burger that I was able to find in San Francisco. The Preparation: Luis Flores, Managing Partner of Super Duper, took me on a tour of the small kitchen and showed me the magic in action. The Super Duper burger started its life as a loose ball of coarsely ground Chuck in a refrigerated drawer. Once ordered, the ball of Chuck was placed on an oddly cool flat top. The second the beef hit the high-tech griddle, the surface heated at a remarkable pace. Within seconds the beef was already sizzling. At that point, the ball was smashed to about a 1/3 inch thickness. It was seasoned. It was flipped at the one minute mark, seasoned again, and allowed to cook for an additional minute. While that was happening, a bun was placed in a commercial toaster (a carnival ride for baked goods). The toaster heated the bun throughout and did not require the bun be buttered. 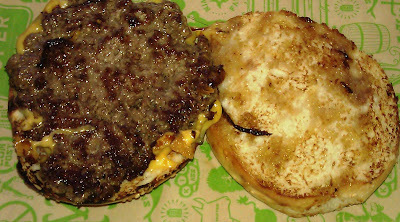 The cooked burger was placed on the bun, and the toppings were applied. 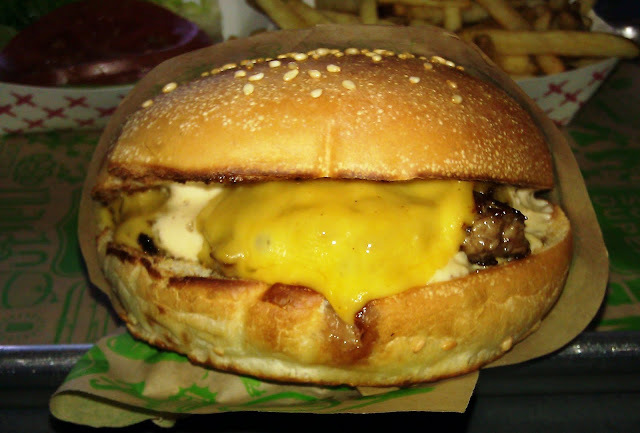 The even heat within the bun and beef fused the cheese to the patty within a moment. The whole process took less than 3 minutes. This resulted in a juicy burger, which was not greasy. It also created a melt-in-the-mouth, tender bite. The burger came out at just a hair past Medium. The Cheese: The California Cheddar perfectly complemented the dish. The Cheddar was creamy and just sharp enough to lend its voice to the strong notes of beef, salt, mineral, and funk from the beef. The texture of the cheese was enhanced by the fact that it been melted by the steam coming off both the burger and the bun. The Bun: This was a bun from La Boulange, and it was specifically made for Super Duper. The perfectly toasted bun was just crisp enough on top, as well. This provided a nice shift in texture as one bit into it. The bun was mild in flavor and took nothing away from the burger. The bun was as moist as a fresh biscuit, but it was dense and firm. The bun was utterly splendid. The Meat To Ratio: This was perfect, and the last bite was the same as the first. The Fries: The thin fries came par-cooked and frozen. They were cooked in canola oil to a crisp golden brown and finished with the sea salt. The fries were splendid. The Toppings: The vegetable toppings that accompanied the cheeseburger were of very high quality. I was impressed at how ripe and flavorful the tomato slices were. Mr. Flores checked in the produce himself. The Confections: The strawberry shake and the chocolate dipped cone were both ridiculously good and wholesome tasting. The Value: $5.00 for a spectacular tasting and perfectly prepared burger was tremendous value. Honestly, I walked into Super Duper with nearly no appetite, and I walked out stuffed, because everything was so good. Luis Flores shared with me that his philosophy behind Super Duper was to take great ingredients and prepare them simply. A cheeseburger is a remarkably simple thing to prepare well. Super Duper prepared the best burger that I have had in San Francisco. This burger should be on everyone's Top Ten list. If you liked Roam Artisan Burgers, then you would LOVE Super Duper. Burger Review : Super Duper made an amazing and honest burger for a great price. You need to try Super Duper. You need to eat the best burger in San Francisco. 17AUG11--I took Fat Bruce Lee to the recently opened Super Duper location on Market Street, and it was every bit as good as the burger that I enjoyed several months ago. Super Duper sustained a line of about 7 customers the entire time that we were there, and they kept cranking out meals with a 10-minute wait time. The operation there was tight. The chicken breast sandwich was also terrific. It was moist, and the chicken had been marinated in an Ancho Chile salsa for about 24 hours. The resulting flavor was complex and extremely satisfying. Super Duper was also planning on taking over the Johnny Rockets space on Chestnut Street in Cow Hollow. Cow Hollow--congrats on getting the best burgers in the city of San Francisco. Seriously, they could have named the place Super, Fantastic, Totally Freaking Amazing Burger, and it would not have been exaggeration. It takes a serious burger dude to not feel intimidated into rating hipster Frisco burgers above a place like Super Duper. Nice review. I like how you're not shy about asking to speak with managers. It ads insight and is an extra step most burger reviewers wouldn't even think to bother with. Can't wait to try this burger next time I fly up to my favorite town. As for the bun pictured above, it is what I consider the proper beef to bun ratio. 95% of burgers are made with an over sized bun, if only for the simple and pitiful reason that thinner buns appear common and uncouth to burger hipster wannabees. What is the white goo on the burger in your photos? Mayo? Cheese? Will Five Guys overtake In-N-Out?